The 8th Texas Cavalry, popularly known as Terry's Texas Rangers, was a regiment of Texas volunteers for the Confederate States Army assembled by Colonel Benjamin Franklin Terry in August 1861. This actor is dressed as one of them. 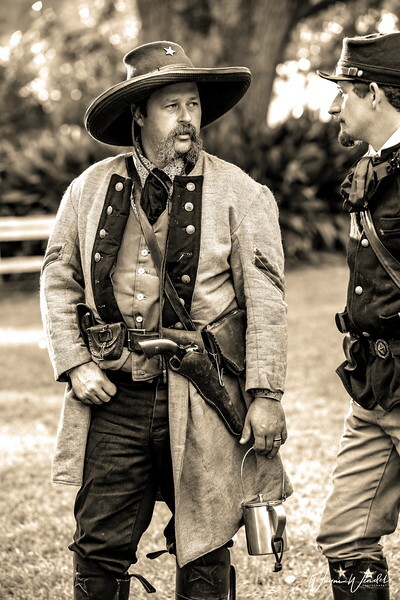 This is a great shot of one of the re-enactors. I love the b/w as it's perfect for this capture. Well done! Your choice of sepia for this shot is perfect--very well done. Superb processing. Really gives it a feel of being contemporary with the uniforms. Love the composition as well, having the one guy half on the edge of the frame really works. Excellent shot and a great treatment! Great monochome processing to 'age' the image.